Morgan Tsvangirai was the most effective opposition leader in Zimbabwe since independence. His greatest strength was his bravery. He risked his life to stand up to the authoritarian rule of Robert Mugabe and his allies in the security forces. He was twice severely beaten for his pains and three times charged with treason. Despite this, he continually found himself out-manoeuvred by Robert Mugabe who refused to cede any power. Tsvangirai was eventually sworn in as prime minister but found it impossible to achieve any meaningful reforms. However he played a part in paving the way for the overthrow of Mugabe in 2017. Morgan Richard Tsvangirai was born on 10 March 1952 in the Gutu area of Southern Rhodesia, one of nine children of a carpenter. He left school to become a textile weaver, but then went to work in a mine in Bindura, 50 miles north-east of Harare. Tsvangirai became involved in union activities and was elected to the executive of the National Mine Workers Union. When Zimbabwe gained independence in 1980 he joined Mugabe's Zanu-PF party and rose to become a senior official. By the late 1980s, he had become head of the Zimbabwe Congress of Trade Unions, which had been set up on independence. As the congress began to break its close ties with Zanu-PF, Tsvangirai found himself at the head of a powerful opposition group. In December 1997 and early 1998, he led a series of strikes, known as "stayaways", against tax increases, which brought the country to a standstill. These forced Mugabe's government to cancel two tax rises and to abandon a promised tax to help fund war veterans' pensions. In apparent revenge for his part in defeating Mugabe and the war veterans, a group of men burst into Tsvangirai's office, hit him on the head with a metal bar and attempted to throw him out of his 10th floor office window. In 1999 Tsvangirai founded the Movement for Democratic Change (MDC), which attracted a younger generation of Zimbabweans, particularly urban workers. They were less interested in Mugabe's historical role as Zimbabwe's founding father and more concerned with his economic mismanagement. Within months, the new party had helped defeat the government over its referendum on constitutional reform, which included clauses allowing the seizure of white-owned farms without compensation. In the 2000 general election, his fledgling movement loosened the ruling party's usual iron grip on power, gaining 57 of the constituency-based seats, against 62 held by Zanu-PF. It was a result without precedent in Zimbabwe, where opposition parties had never held more than a handful of seats. In addition to the government's dramatic defeat over its constitutional reform bill, Tsvangirai won an aura of credibility that was enhanced by the general election result. Tsvangirai himself was not elected. Turning down the opportunity of a seat in one of the cities, where the MDC's support was strongest, he chose instead to stand in his home district - which, like most rural constituencies, was won by Zanu-PF. Now seen as a real threat to Mugabe's presidency, Tsvangirai was arrested shortly after the election and charged with making threats against the president, accusations that were dismissed by a court. In 2001 Tsvangirai made a speech condemning the massacre of anti-Mugabe rebels in Matabeleland in 1984 when an estimated 20,000 people died. 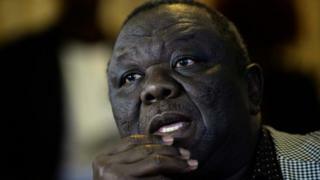 In his speech, Tsvangirai promised that those responsible would be brought to justice should the MDC come to power. He was arrested again in 2003 after using a press conference to accuse Mugabe of using violence and intimidation to maintain his hold on government. Officials of the MDC found themselves at loggerheads in 2005 with some members, including Tsvangirai, urging a boycott of any future elections until it could be certain that a vote would be free and fair. The resulting split proved a disaster in the senate elections, with MDC candidates winning only five of the 60 seats. But despite the internal rows, the MDC was still gaining popular support and was perceived by Mugabe as a major threat. In 2007 Tsvangirai was again arrested and, this time, taken to a special forces barracks, where for several hours he was badly beaten, causing a fractured skull and internal bleeding. He was taken to a local hospital where TV pictures of his injuries were taken by a freelance cameraman, Edward Chikomba, and smuggled out of Zimbabwe. Chikomba was later abducted and killed. Just weeks after the beating, police raided the MDC headquarters and again Tsvangirai was arrested. On 29 March 2008, with the MDC still split, presidential and parliamentary elections were held in Zimbabwe. The results of the presidential election were withheld for more than a month amid allegations that the government was attempting to rig the ballot. After a recount, the Zimbabwe Electoral Commission declared that none of the candidates had achieved the required 50% and ordered a second round of voting. Tsvangirai, buoyed by the news that the now reunited factions of the MDC held a majority of the parliamentary seats, initially agreed to take part in the second round. But his campaign was facing increasing levels of intimidation and violence, with MDC rallies being attacked and supporters beaten and killed. Just days before the poll he declared that a free and fair vote was impossible and withdrew from the contest, leaving Mugabe as the only candidate. In July 2008 Tsvangirai met Mugabe for the first time in a decade as a prelude to negotiations over a possible power-sharing arrangement. Against a background of continuing violence, a deal was hammered out whereby Mugabe agreed to surrender day-to-day control of the government. In February 2009, Tsvangirai was sworn in as prime minister. Despite the agreement, Mugabe continued to hold the reins of power. The policy of land reform continued with so-called "war veterans" continuing to invade and occupy farmland. Tsvangirai faced fierce criticism from many sections of the MDC, which claimed his decision to share power had allowed Mugabe to remain in office. He also failed to stand up to Mugabe in what was supposed to be an equal partnership, allowing the wily president to make up the rules as he went along. The result was a loss of confidence in Tsvangirai's leadership, which eventually led to a crushing defeat for the MDC in the July 2013 elections. Just two months later Tsvangirai resigned as prime minister, and Mugabe underlined his dominance by abolishing the post. Morgan Tsvangirai, although a consummate orator, lacked Mugabe's political nous and innate cunning, and even Tsvangirai's supporters said he was often outflanked by the president. But Tsvangirai had the courage to face down the violence and intimidation, and give ordinary Zimbabweans the hope that there was an alternative to the discredited Mugabe regime. In the end he lived to see the overthrow of the president he had battled for so long.